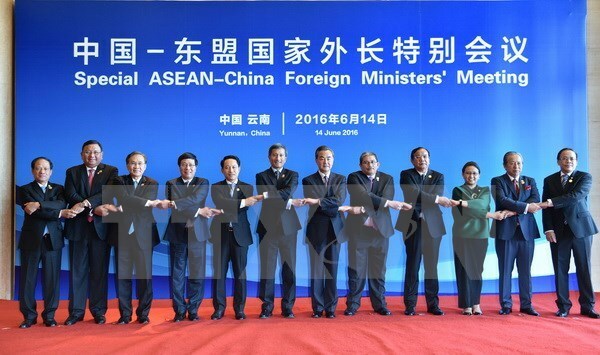 Kunming (VNA) – ASEAN-China relations and the East Sea issue dominated a special meeting of foreign ministers of ASEAN and China in Kunming, in the Chinese province of Yunnan on June 14. Deputy Prime Minister and Foreign Minister Pham Binh Minh led the Vietnamese delegation to the event which was co-chaired by Chinese Foreign Minister Wang Yi and his Singaporean counterpart Vivian Balakrishnan. Speaking at the meeting, Deputy PM Minh affirmed that Vietnam and ASEAN attach importance to ties with China, and underscored the importance of the ASEAN-China strategic partnership to peace, security and prosperity in Asia-Pacific. He proposed boosting bilateral cooperation in effectively realising the 2016-2020 Action Plan, focusing on the priority fields of the economy, trade, investment, connectivity, environment, climate change, agriculture, and food and water resource security particularly in the Greater Mekong Sub-region. According to him, joint work should be intensified to deal with regional security challenges, even in the East Sea and thorough preparations should be made to celebrate the 25 th anniversary of ASEAN-China dialogue relations, particularly the commemorative summit slated for September in Laos. Expressing concern over complicated developments in the East Sea and their obstacles, the Deputy PM called on ASEAN and China to increase dialogues and cooperation to deal with the issue while complying with commitments by concrete actions, particularly in the peaceful settlement of disputes in line with the law, including the 1982 United Nations Convention on the Law of the Sea (UNCLOS). He urged for refrain from the use or threat to use forces, self-restraint and preventing actions that further complicate the dispute, particularly non-militarisation in the East Sea, full and effective implementation of the Declaration on the Conduct of Parties in the East Sea (DOC) and the early formulation of a Code of Conduct in the East Sea (COC). The Vietnamese leader also pushed forward progress in bilateral talks on sea boundary delimitation. Participants expressed their delight at the outcomes of the implementation of the 2011-2015 Action Plan for the Joint Statement on the ASEAN-China Strategic Partnership, including the upgrade of the ASEAN-China free trade agreement. China remains ASEAN’s biggest trade partner with a two-way trade of 470 billion USD which is expected to soar to 1 trillion USD by 2020. Ministers sought to further promote coordination across the fields of politics-security, economy, socio-culture and development. They committed to effectively materialising the 2016-2020 Action Plan and making thorough preparations for the Commemorative Summit for the ASEAN-China Relations to be held in Vientiane, Laos this September, including drafting the ASEAN-China Joint Statement on enhancing manufacturing capability, increasing collaboration via ASEAN mechanisms to deal with common challenges, contributing to peace, security and development in the region, including the East Sea. The ASEAN foreign ministers shared the view that the maintenance of peace, stability, overflight and navigation security, safety and freedom in the East Sea is shared responsibility and interests of countries, firstly ASEAN and China. They expressed their concerns about recent complex happenings in the East Sea, especially land reclamation, large-scale constructions on rocks, militarization on man-made islands and actions affirming sovereignty not grounded on international law. They asked ASEAN and China to show political will and greater efforts to ensure peace and security in the East Sea, comply with basic principles of international law, especially showing respect to legal and diplomatic processes and the 1982 UNCLOS. Measures to build trust and preventive diplomacy need to be adopted, they said. The two sides also hailed the outcomes of the ASEAN-China senior officials’ 12th meeting on DOC implementation recently held in the Vietnamese northern province of Quang Ninh.